Remember that cigar-shaped interstellar object that whizzed through our Solar System last year? It was pretty weird, right? Well, new research shows ‘Oumuamua is even stranger than we realised. ‘Oumuamua, pronounced “oh-MOO-ah-MOO-ah,” is a comet and not an asteroid, according to research published yesterday in Nature. That’s not a huge revelation, as many scientists had already assumed as much. What’s special about this new paper, however, is that it offers tangible evidence to bolster the case. Seems like a fine point, but there’s a big difference between asteroids and comets. Both types of objects are leftovers from the formation of the Solar System, but where asteroids are composed of metals and rocky material, comets are made from ice, dust, and rocks. Typically, comets have elongated orbits that take them to the outer reaches of the Solar System, but as they venture inwards, the Sun’s rays cause gas and dust to shear off, producing a glowing cloud of material called a coma and a visible tail. In the case of ‘Oumuamua, the dark, 2,620-foot-long object was detected on October 19, 2017 using Hawaii’s Haleakala Observatory, and scientists have been tracking it ever since. ‘Oumuamua came to within 20.5 million miles (33 million km) of Earth before heading back toward interstellar space—and it appears to be in a hurry. By combining data collected from the NASA/ESA Hubble Space Telescope, the Canada-France-Hawaii Telescope, ESO’s Very Large Telescope, and the Gemini South Telescope, a team led by Marco Micheli from the European Space Agency noticed something odd about ‘Oumuamua: It’s moving faster than expected. The extra speed isn’t ludicrous by any means, but it’s still measurable. ‘Oumuamua is still slowing down thanks to the gravitational influence of our Sun, but not at the rate expected by celestial mechanics. The reason, say the authors of the new study, is that ‘Oumuamua is still venting material from its surface. Solar heating is producing an effect called outgassing, and the material ejected from the object’s surface is creating a tiny amount of thrust. It’s like a built-in propulsion system, but one that only becomes active inside the warm, cosy realms of a star system. To make sure the acceleration effect was not being caused by something else, the researchers considered scenarios like solar wind, a collision with another object, its mass being different than calculated, and other known or suspected astrophysical phenomena. However, “these explanations are all either physically unrealistic or insufficient to explain the observed behaviour,” write the authors in the study. Video showing the interstellar comet’s expected and measured trajectory. “Also, the unlikely theory that ‘Oumuamua is an interstellar spaceship was rejected: the smooth and continuous change in speed is not typical for thrusters and the object is tumbling on all three axes, speaking against it being an artificial object,” according to Hubble press release. As a related aside, research from late last year came to the same conclusion. The suspected presence of outgassing was the smoking gun needed to prove that ‘Oumuamua is a comet and not an asteroid. Now, you’re probably thinking, “What the hell, Dvorsky, a minute ago you said comets produce a visible coma and tail when they get close to the Sun! But ‘Oumuamua doesn’t exhibit any of this!” Fair point, but there is a good reason for this, one demonstrating how freakin’ weird this object really is. ‘Oumuamua, the researchers speculate, is venting unusually large, coarse dust grains. Micheli’s team is theorizing that small dust grains, which that typically litter the surface of comets, eroded during the course of ‘Oumuamua’s epic journey through interstellar space (we have no idea how old this object is, so who knows how long it’s been careening through the Milky Way, which formed 13.5 billion years ago). All that’s left on this comet are the larger dust grains. If ‘Oumuamua is producing a cloud composed of these large particles, it would be too dim for Hubble to see it. 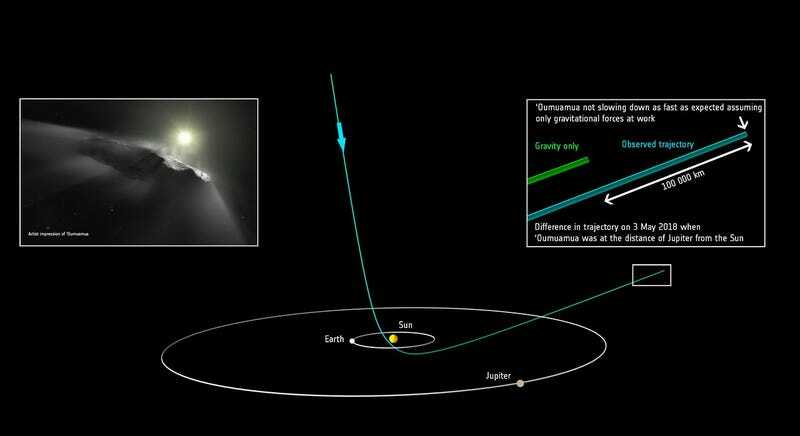 But the unexpected deviation in its acceleration suggests these grains are very much there, and that ‘Oumuamua is, or was, in an outgassing phase during its brief time in our Solar System. Sadly, this new result means it’s going to be exceptionally tough for astronomers to figure out where in the galaxy this object came from. If it had been an asteroid with a boring and predictable speed, scientists should have been able to backtrack its trajectory to its star system of origin. But with its variable speed, that’ll now be a physics task of herculean proportions, and probably something best suited for a future supercomputer.